Spending Time Outdoors Has Never Looked So Good! Having a great outdoor living space in which to relax and entertain can bring new life to your property. Our creative design team at Blooms Landcare in Fort Worth, TX is passionate about helping our clients achieve the perfect outdoor living space for their home or business. Whether you are needing a brand new patio space for parties and family get-togethers, a gorgeous outdoor meeting space to impress clients, or an outdoor kitchen where you can cook under the stars, Blooms Landcare can assist you. A lot goes into the aesthetic and functionality design of a proper outdoor living space. Our team of landscaping professionals understands all the components involved. This includes masonry, proper planting locations, irrigation, and water systems. Our goal is to achieve a final product that is exactly what you envisioned. We’ll discuss any decorative elements, such as arbors or furniture, that might work with your outdoor kitchen or patio. When you call Blooms Landcare, we will set up an appointment with you to discuss your specific needs and requirements. We will then put together a strategic plan to achieve the look and feel of your outdoor living environment. We are always happy to answer any questions or concerns you have along the way. Here at Blooms Landcare, we are excited to help our customers’ plans for their outdoor kitchens become beautiful, practical realities. A kitchen is an ideal addition to a outdoor space, and we are more than happy to work with you to make certain your kitchen is everything you want it to be. We will discuss your current space and your needs, and together determine what the most cost-effective and functional solution will be. We’ll make all the plans for whatever electricity, plumbing, and gas will be needed, and provide ideas regarding materials, supplies, appliances, and more. Whether you want an edgy, contemporary look or a more classic, rustic feel, Blooms Landcare will ensure that your outdoor kitchen lives up to all your expectations. When it comes to your yard, several factors will go into crafting the perfect outdoor living space. Here at Blooms Landcare, we’re passionate about helping you create the most ideal outdoor space per your specific vision and design ideas for your home! 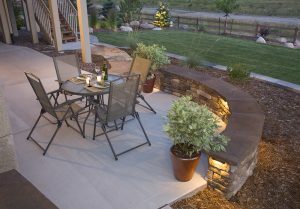 Incorporate landscape lighting into your design scheme. Use native plants and grasses. Build a pathway, or several! Plant more trees on your property. These are just some of the key elements to a beautiful outdoor living space – contact Blooms Landcare to schedule a private design consultation for your home. If you have questions about how to create your perfect outdoor living space, contact the experts at Blooms Landcare at (817) 688-5352. Feel free to fill out our online contact form for a free initial estimate.